Regina for steak and seafood. Click here to book from a selection of Regina hotels. The sunniest capital city in Canada, Regina, is a real oasis on the prairies. Almost every single tree in the city has been hand-planted, and the expansive Wascana Centre stretches through the heart of the city, encompassing 2300 ha (about 5700 acres) of parkland. One of the largest urban parks in North America, the park consists of 6 distinct sub-parks, as well as an IMAX theatre, Science Centre, Mackenzie Art Gallery, a waterfowl park, and even a small island on the lake. Delve into the history of the prairies by visiting one of Regina's exciting museums. The new RCMP Heritage Centennial Museum is a 3 million dollar project situated on the grounds of the RCMP training center, and celebrates the past, present, and future of the RCMP. The Regina Plains Museum depicts life on the plains through art and murals. The Diefenbaker Homestead is a log home built by Diefenbaker (Canada's Prime Minister from 1951-63) and contains furnishings and original family artifacts. The Royal Saskatchewan Museum, with three galleries focused on Life Sciences, Earth Sciences, and First Nations History, caters to visitors of all ages and interests. Regina also has a thriving cultural life, and a visit to the Saskatchewan Centre for the Arts will attest to the diversity of events offered here. Visit Regina and see why the Queen City rules! 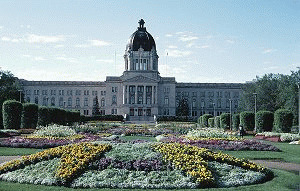 Regina Accommodations include hotels, motels, bed and breakfasts and nearby campgrounds. Conveniently located adjacent to Trans-Canada Highway 1, the Comfort Inn hotel offers something for everyone. This Regina, Canada hotel is minutes from the Wascana Lake, Regina's Warehouse District and Casino Regina. Tour the must see Royal Canadian Mounted Police Sunset-Retreat Ceremony or enjoy a Saskatchewan Roughrider game at Mosaic Stadium. Within walking distance of shopping and entertainment, the West Harvest Inn Regina offers 105 well-appointed Guest Rooms. We offer our overnight guests ample free plug-in parking, use of fitness facilities, free local and national papers, in-room tea and coffee, free local calls and faxes. Meeting rooms can accommodate up to 200 delegates. Welcome to Regina's premier boutique hotel, the Holiday Inn Express Hotel & Suites. The newly renovated hotel features 78 graciously designed guestrooms & suites. The Holiday Inn Express Hotel & Suites Regina is perfectly placed in the heart of Regina's downtown business, entertainment district and Casino Regina. This Regina hotel features an onsite pub. Free Wi-Fi is available in every room. Regina International Airport is a 10-minute drive away. Spacious rooms feature tan colors and wood furniture. This hotel provides each room with a refrigerator and coffee facilities. Entertainment options include 50-inch flat-screen cable TVs and iPod docking stations. Featuring free WiFi throughout the property, we offers pet-friendly accommodations in Regina. We are conveniently located near the Mosaic Stadium, Regina Casino, RCMP Heritage Center and the Brandt Center. Hotel guests will also be within 5 kilometers of the Museum of Natural History and the Regina Municipal Airport. This hotel is 4 miles from downtown Regina and 11 miles from Regina Regional Airport. The property offers a kitchenette and free Wi-Fi in every studio. This hotel offers a coffee maker, refrigerator and microwave. The studios features a 42-inch flat-screen TV and an iPod docking station. The property features a 24-hour business center and gym. Guests can wash laundry or shop in the on-site store. Since 1967, our long standing experience in hotel accommodations has made our hotel a true Regina landmark. It has long been regarded the cornerstone of the city skyline. Towering above the landscape, the hotel sits proudly nestled in the heart and soul of the city. With business, shopping, theatre, a casino and government offices nearby, we are a focal point for the community. The Holiday Inn Hotel & Suites Regina is a newly built, full service hotel completed in June 2004, having numerous amenities to make your stay memorable. Try one of our 'KidSuites', having it's own child's bunk-bed and play area with seperate King sleeping area for Mom & Dad. If a small meeting is what you require, but don't need a large room, try our unique 'Conference Suites'. This hotel is located 4 miles from downtown Regina and Casino Regina. The hotel offers free parking and free Wi-Fi in every room. The hotel rooms include a coffee maker and work desk. Hairdryers are available from front desk. The hotel provides a daily continental breakfast. The hotel also offers laundry facilities. The Regina Airport is 11 miles from the hotel. Conveniently located in downtown Regina. Close to Casino Regina, Cornwall Shopping Centre, Government Offices & Wascana Park. Only minutes away from Saskatchewan Science Centre, IMAX Theatre, Royal Saskatchewan Museum & Saskatchewan Legislative Bulidings.